We all want to get to yes, but what happens when the other person keeps saying no? How can you negotiate successfully with a stubborn boss, an irate customer, or a deceitful coworker? 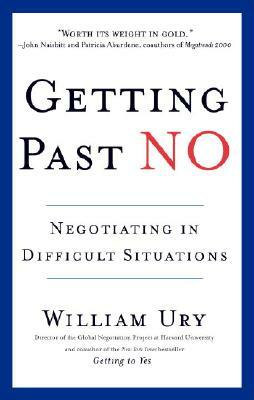 Getting Past No is the state-of-the-art book on negotiation for the twenty-first century. It will help you deal with tough times, tough people, and tough negotiations. You don’t have to get mad or get even. Instead, you can get what you want! A world-renowned negotiator, mediator, and bestselling author, William Ury directs the Global Negotiation Project at Harvard University. Over the last thirty years he has helped millions of people, hundreds of organizations, and numerous countries at war reach satisfying agreements.